The blogosphere was jerked into excitement when Google gave a sneak preview of its new service, Google Wave. Only the select few have an account, but there’s an 80-minute video about it on YouTube for the rest of us. The service is an HTML 5 app, and so HTML 5 has gone from being too far away to care about to today’s hot topic. The DIV and SPAN elements, in conjunction with the id and class attributes, offer a generic mechanism for adding structure to documents. These elements define content to be inline (SPAN) or block-level (DIV), but impose no other presentational idioms on the content. Thus, authors may use these elements in conjunction with style sheets, the lang attribute, etc., to tailor HTML to their own needs and tastes. When developing the HTML 5 spec, the editor, Ian Hickson of Google, analyzed over a billion web pages to find out how authors were actually using these elements. He discovered that in the top 20 class names used in the markup for this huge set of data were classes for common requirements: footer, header, nav, menu, content, and main. What’s really interesting is that we can use HTML 5 elements right now, even though the main browsers are yet to support HTML 5, because CSS allows you to style anything. 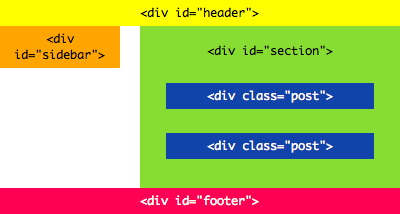 Then we can add style rules – floating, background colors, margins. I’ve put together an example; let’s check it out! Older versions of the Gecko rendering engine, currently used in Firefox 2 and Camino, have a parsing bug which means Gecko closes an unknown element when it sees the start tag of a block-level element like p, h1, or div. There are workarounds, but as Firefox 3 is out, Camino 2 is in beta, and both browsers’ users tend to upgrade quickly, it’s safe to assume that the problem will be history by the time you start building HTML 5 sites for the real world. I’ve surrounded it with a conditional comment, so the other browsers can ignore the IE-only code. 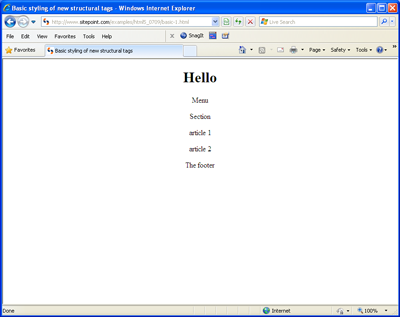 Now, lo and behold, your page styles in IE – if you’re using IE, you can see the fixed example here. Let’s have a more detailed look at what each of these structural tags are for, and meet some new ones. header is our new element for headers, oddly enough. The natural place to use this element is for the main banner at the top of your web site, but a page can certainly contain more than one header. You’ll notice that we have multiple articles in our rudimentary blog post; each of these can have another header that contains the heading, byline, and date for that article. This is perfectly valid HTML 5: on the topic of footers, the spec says “the footer element represents a footer for the section it applies to,” and also: “Footers don’t necessarily have to appear at the end of a section, though they usually do.” Check out the source of our example and validate it. The additional headers and footers can be very easily styled with simple descendent selectors – article header and article footer. 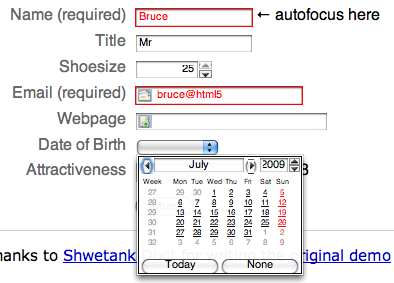 Our third example shows a blog with two entries, each with its own header and footer elements. It seems unlikely to me that the hgroup element will make it through various revisions of the spec, and I struggle to find a real use case for it in this example. I think that’s ambiguously written; what I think it should say is that “only sections that consist of blocks whose primary purpose is navigation around the site are appropriate,” so that lists of links to sponsors or advertisers could be distinguished from a site’s navigation. 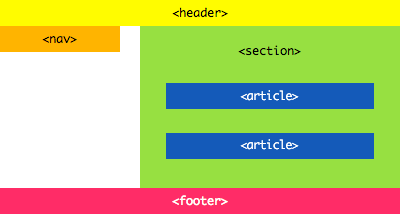 You can, if you wish, include primary navigation in the header element, but this is optional. Just like now, navigation is usually marked up as an unordered list of links or, in the case of breadcrumb trails, an ordered list. Our fourth example shows comments within a blog entry. We left aside out of our basic example. It’s a useful if confusing beast: I’ve seen people assume it’s the way to mark up a sidebar, which on a web page is usually a navigation menu and thus best marked up with nav. … used to annotate illustrations, diagrams, photos, code listings, etc, that are referred to from the main content of the document, but that could, without affecting the flow of the document, be moved away from that primary content, e.g. to the side of the page, to dedicated pages, or to an appendix. You’ll note that I’ve also used the small element – unlike HTML 4, this is defined as a way to represent “legalese describing disclaimers, caveats, legal restrictions, or copyrights. Small print is also sometimes used for attribution.” In other cases, figure is remarkably close to the aside element – too close in my opinion. 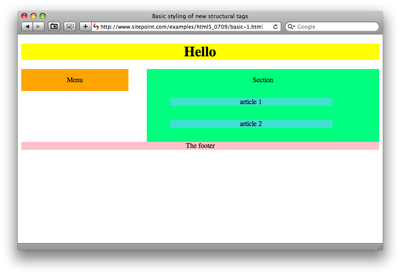 The section element divides the page if there are no more appropriate structural tags above. It’s more than just another kind of div, though – section imposes a kind of hierarchy upon the content. In a purely HTML 5 world, you only use h1 (for backwards compatibility), and the outlining algorithm works out the heading level from its context within the page’s sections. <body> ... <section><section><h1>is a heading 3, and so on. In this way, you can have more than six levels of heading. However, it’s best to continue to use h1–h6 for now, with sections if you choose. Assistive technologies such as screen readers have yet to catch up to the new outlining algorithm, and a proper hierarchy of headings is vital for blind users to navigate pages. A 2D drawing API for scripting graphics using the new canvas element, which is supported in all the major browsers except for Internet Explorer. registerProtocolHandler and registerContentHandler, which allow web applications to register for certain protocols or MIME types. Both are available in Firefox. A manifest caching mechanism to support offline web applications, available in Firefox and Safari. Video and audio APIs. The majority of the API works in Firefox, Opera (experimental build), and Safari – although Safari only uses Apple’s proprietary .mov format, rather than the open-source Ogg formats supported by Firefox and Opera. window.postMessage: cross-document messaging implemented in all major browsers. 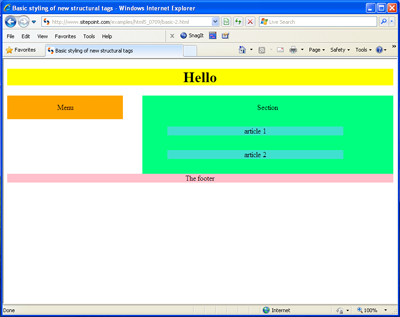 A drag and drop API with a draggable attribute, supported in Firefox 3.5. An editing API that hooks into the contenteditable attribute allowed on any element, already in all major browsers. Client-side persistent storage using key/value pairs and support for embedded SQL databases: key/value pairs are in Firefox, Safari, and IE8, while SQL is supported only in Safari at this point. Become Involved – Have Your Name in Lights! Hopefully, this brief article has shown you enough of the structural aspects of HTML 5 to prove that it’s good to start thinking about it now; it’s being added to browsers and used as we speak. Sure, at the moment it’s being used mostly for personal sites, but that’s how CSS-only layouts started and now they’re mainstream. Structural elements like article or nav can be used right now, and with browsers adding support for more features all the time, now’s a great opportunity to get started with HTML 5. If you fancy becoming more involved, there’s still time – try using it and giving feedback to the specification group via the WHAT-WG mailing lists. The editor, Ian Hickson, has put out a call for people to review the spec – looking for confusing items, typos, and other small problems. If you find one, you’ll be mentioned in the acknowledgements. There’s plenty to do, so dive in!